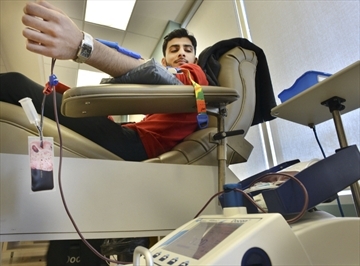 A small Muslim congregation in Hamilton is donating blood to help dispel the cloud of violence hanging over Islam after recent terrorist attacks. Extremists have shed the blood of innocent people in the name of Islam, Imam Hanan Sobhi said Thursday. The congregation held a group blood donation Thursday afternoon to demonstrate the value Islam places on the sanctity of life. Sobhi expected about 30 members of his congregation to give blood between 1 and 6 p.m. at the Hamilton Blood Donor Clinic at 35 Stone Church Rd. There are a little more than 500 Ahmadiyya Muslims in Hamilton, part of a community of millions in more than 200 countries. Adherents to the faith believe the messiah has arrived in the person of Mirza Ghulam Ahmad (1835 to 1908) of Qadian, India. They believe God sent Ahmad to put an end to religious wars, condemn violence and create peace. The Hamilton branch has also launched a campaign called “Muslims for Life,” which draws inspiration from the American Ahmadiyya community’s effort to dispel myths after Sept. 11, 2001 terrorist attacks. Sobhi doesn’t believe it’s fair such a burden is placed on Muslims to fight negative stereotyping but says silence isn’t an answer, either. Part of the local campaign is a show about Islam’s founder called “The Astonishing Story of the Prophet Mohammed,” at Sir John A. Macdonald high school on April 2 at 6 p.m.
Share the post "Muslim congregation holds group blood donation"